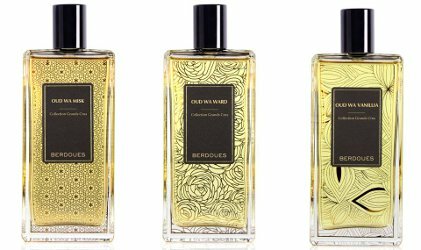 French perfume house Berdoues has introduced Oud Wa Misk, Oud Wa Ward and Oud Wa Vanillia, three new fragrances in the Grand Crus collection (see Colognes Grand Crus). Oud Wa Misk (above left) ~ "The millésime Oud Wa Misk unveils an animal and intimate note of Oud of Thailand, mingled with the sweetness of a musky note. Ours perfumers have given birth to a mysterious, deep, and distinguished blend." Oud Wa Ward (above center) ~ "The millésime OUD WA WARD reveals the power of the Oud of Thailand and the sensuality of the Rose of Turkey. Ours perfumers have created a chemistry between completely opposed ingredients that yet reveals a sensual and precious harmony." Oud Wa Vanillia (above right) ~"The millésime Oud Wa Vanilla carries in it the character of the Oud of Thailand and the warmth of the Vanilla of Madagascar. Ours perfumers have given birth to a powerful and captivating blend with heavily wooded and amber accents." Berdoues Oud Wa Misk, Oud Wa Ward and Oud Wa Vanillia can be found now at Jovoy Paris in France, €125 each for 100 ml. Nice! I should have noticed your link at the bottom regarding the review, but didn’t. No worries. From everything I’ve read, the Assam is the best of the 6 colognes, but I haven’t tried the others. Hello, Serge Lutens bottles, long time no see! I hope these smell better than they look, or at least are more original. Really? But Serge Lutens was hardly the first to use such a bottle shape. When I first saw this, I thought, “Oud Wad?” I am so sorry.